Yes You makes it onto The Shortlist on the 'Place' setting with a perfect score of 15, and five sections of green. This three-year-old filly appears extremely well suited to today's conditions and means I am going to take a closer look. Yes You has been in decent form over the summer with a place and three wins from her last six races. She was disappointing in heavy ground over the minimum trip last time out, however, with a return to six furlongs (a trip she has won over three times) and less testing underfoot conditions will hopefully bring about a return to the excellent form she has been showing. She has been lowered another pound after her last run and is now just the four pounds higher than for her victory at Carlisle in August. The Instant Expert report highlights how well suited to conditions, Yes You is, and it also shows that are not too many other runners in the race that the same can be said about. Rapid Ranger is one that does look well suited, with three sections of green, but apart from that Point Of Woods is the only other runner in the race with a green section. When looking at the Pace report we can see that early leaders here over this distance have a useful record, with 16.06% of them going on to win the race for a level stakes profit of 92.82, and an Impact Value of 1.88. Tanawar looks the most likely to be away the fastest, but Yes You is one of the more prominent runners based on the last four races of each, and I am hoping that Jamie Gormley can get away well on her to secure a good early position and hopefully kick for home and take the race. 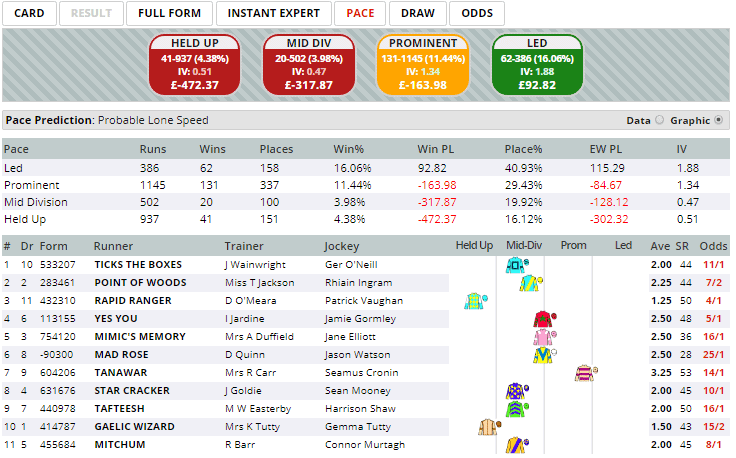 Click here for the 15:25 at Redcar. I think it would be fair to say that you called the forecast on this one. Stat of the Day, 30th October 2017.